Boca Grande in Cambridge, Massachusetts. A favorite spot for burritos in Brookline is getting ready to shut its doors for good, while a familiar name on the local dining scene will be taking over its space. The Brookline Tab is reporting that Baja Betty's in Brookline Village is closing on March 31 after two decades in business, with a location of Boca Grande moving into the Harvard Street space possibly in June. The article says that Baja Betty's owner Brett Albert isn't sure what he will be doing once the eatery closes, though it is possible that he may decide to open another dining spot somewhere. 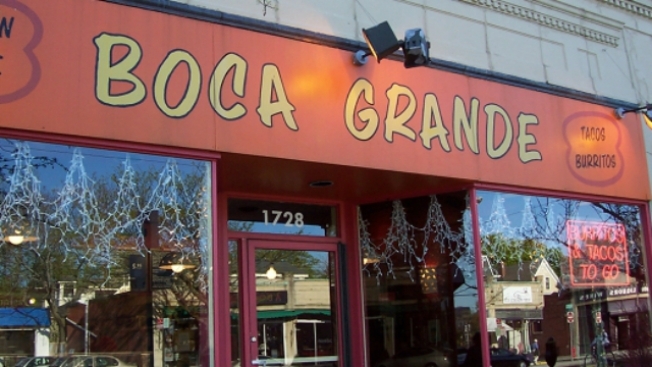 Once it opens, the new location of Boca Grande will join its sole existing location in East Cambridge; its four other locations have all shut down, though the business is now under new ownership and there had been talk of new expansion on the way. Baja Betty's, which first opened its doors in 1997, has been known in part for its Cal-Mex style burritos. The address for the soon-to-close Baja Betty's (and upcoming Boca Grande) is 3 Harvard Street, Brookline, MA, 02445.